The reception to the infographic I put together on Quantifying Digital Humanities has been very positive. In the first 12 hours of it being online, 2600 people had viewed it. At time of writing, 3665 people have looked at it. Which amuses me – many more people have viewed it than are self confessed members of the “Digital Humanities” community. I’ve had many notes saying “this is great”, some suggestions for other sources of information, particularly financial information from other countries, and the spotting of the one typo that managed somehow to get through our rounds of proofreading. Its all good, keep ’em coming. There was some chat on the twitters about whether this was up to date. Thatcamp, for example, already has over 2000 subscribers. The Australasian Association for Digital Humanities joined ADHO on the 1st of January, as did Centernet, but these are not reflected in the counts here – I had to draw a line somewhere, and lets give them a chance to get their members all signed up before we start counting them, eh? There was also some discussion about the fact that these figures are…. well… so small? Have I shot my discipline in the foot by pointing out that there arent actually that many of us, self identifying as Digital Humanists? I’m also aware of the things that aren’t in there. I feature, for example, Digital Classicist, and Digital Medievalist, and Antiquist. Are these part of “Digital Humanities”? Is “Digital Humanities” just the group of people, and events, allied to ADHO and its respective societies? I’m very aware of Digital Classicist and Antiquist – these are the lists I hang out most on, most aligned to my areas of interest. But in the infographic, where is the Association for Computing and History? Where is the Computers and History of Art association? Where is the Digital Resources in the Humanities and Arts conference? (and if anyone has a better, centralised URL for that, do let me know, they suffered spectacular failure to renew their domain name). Where is the Association for Computational Linguistics? The list goes on and on. What else would you count as Digital Humanities that didnt make it on? Why didnt I include these different things on the infographic? Partly because no-one from these organisation or domains came forward to give me stats, as I’m not on their radar. Partly because of my own personal bias, I suppose: my Digital Humanities is going to be different from yours. And partly because I did try to focus on the associations which make up ADHO, and their related initiatives. Or things that call themselves “Digital Humanities”. There are other gaps in the infographic. The funding section – there is a lot more investment in infrastructure worldwide than featured here. But look at the stacks o’ cash already listed. We’re so bad, as a community, at showing where the successes are, and the use and usefulness of that investment. I’m almost scared to ask, quite frankly, for usage statistics from the projects mentioned, or outcomes, etc. That is the nature of research, I know, but if I am presenting piles of cash as a good thing – look! see! DH exists as it has had money thrown at it! – then surely we should be better versed in saying what the results of all this were? Overall, its been great fun putting together this infographic on Digital Humanities. It is, however, an infographic on DH, not the infographic on DH. What would your mapping of DH look like? 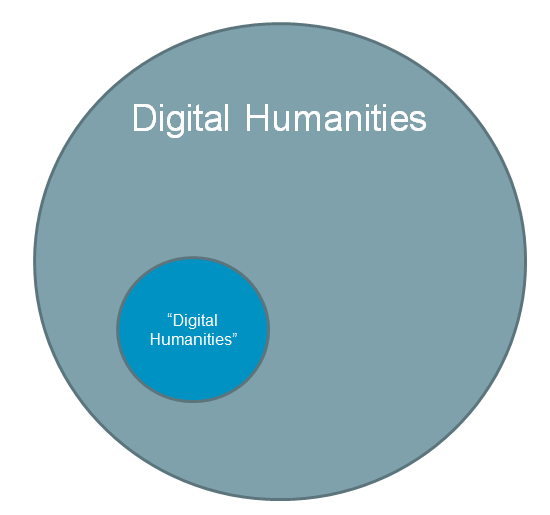 Are you someone who does “Digital Humanities”, or someone who does Digital Humanities? Does this even matter? Next > Congratulations, Claire Ross!